Now that Fred has the project in his Workbench he needs to modify several of the files and synchronize with the repository in order to commit them. Observe that the Project Explorer updates the CVS state of a resource. 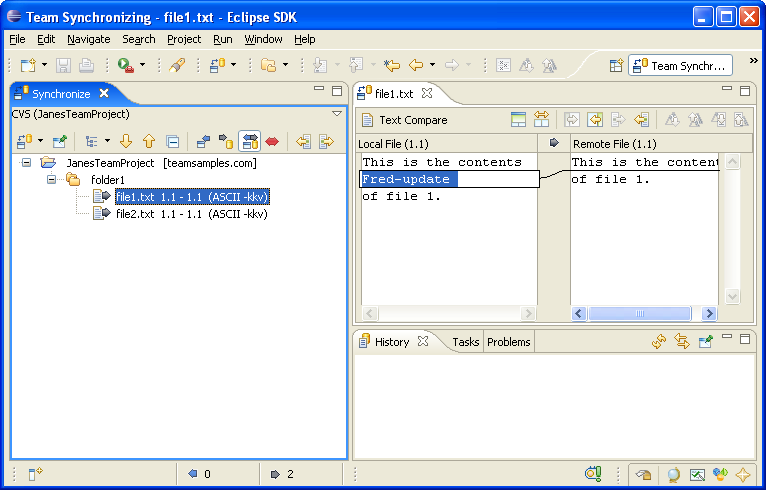 Notice that the two files which Fred has changed are preceded by ">". Often choosing the project is the easiest thing to do. Let's do that. 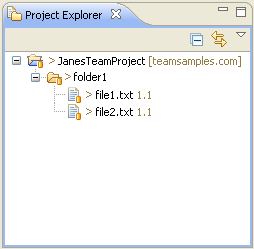 Select the project and choose Team > Synchronize with Repository from its context menu. When you are asked to switch to the Team Synchronizing perspective select Yes. When the Synchronize View opens Fred can browse the changes he made and at the end should commit his changes to file1.txt and file2.txt by selecting JanesTeamProject in the Synchronize View and from the context menu select Commit. You will have to enter a commit comment before committing the changes.